The glass is smoked forming a thin layer of carbon soot. It is then fixed by various means depending on the desired outcome and water gilded. 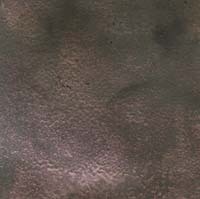 It can produce a soft dark patination or a speckled broken texture. Lay the glass flat so that you can access it underneath (I haven't found a way to use this on shop windows because it doesn't work with vertical glass). Get a candle with a very long wick and hold it at sufficient distance so that the flame deposits the soot on the glass. It shouldn't be so thick that you can't see through it, just a tinting layer. You could also use a rolled up piece of newspaper. The carbon deposit forms black swirl shapes which can be fixed or not fixed depending on your requirements. 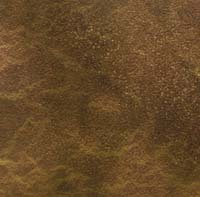 When applying the water size, the soot moves with it creating a speckled pattern in the gild. Be careful you don't wash it all away as it is extremely fragile. Spray the soot with a workable fixative such as hair spray. When applying water size, it can handle one pass of the size without moving but another pass and the soot will begin to break and move in large flakes. It creates a broken, chipped finish with some sections of the original swirl showing. Spray the soot with a permanent fixative such as a varnish or lacquer. The smoke swirl is retained and can be water gilded over for a satin finish with soft dark toning.